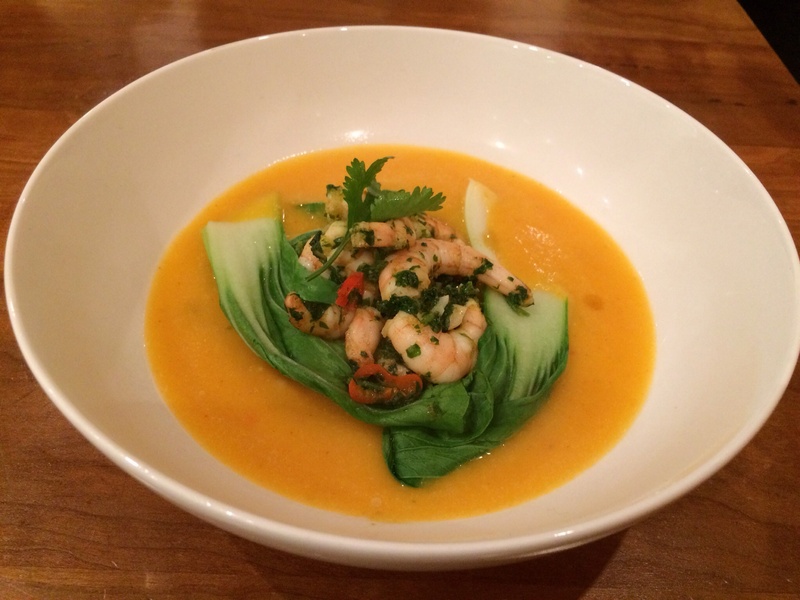 Spicy prawns on a pumpkin and coconut broth. Nice and spicy for Firework Night and using up some leftover pumpkin from Halloween. 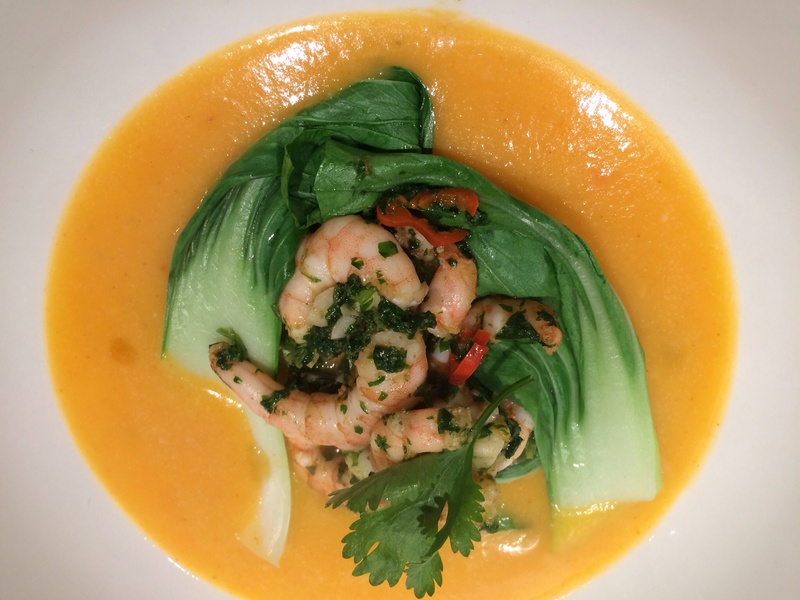 While the broth simmers chop up some herb, chilli and garlic to quickly fry a few prawns. I’m using up some pumpkin that I have left over but don’t go and buy a whole new pumpkin. You can find pieces bagged up in the vegetable section in most supermarkets. 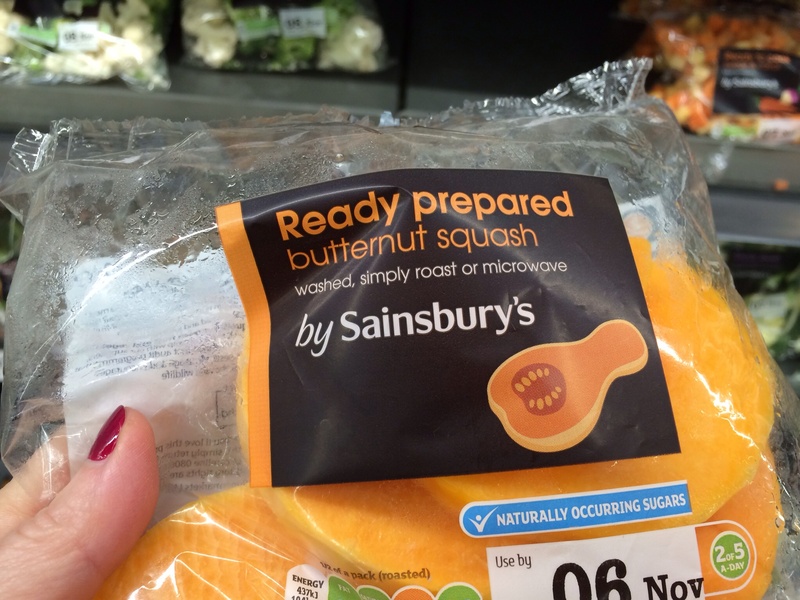 I am using 400g but I found a packet of butternut squash in Sainsbury’s weighing 350g so you could use that. Serves 2. Drizzle some olive oil in a saucepan and gently fry the onion and finely diced pumpkin, 2 of the garlic cloves, half of the finely sliced red chilli, and the ginger. Stir for a few minutes. Add the coconut milk and the bouillon powder stir and simmer until the pumpkin is soft (about 15 minutes). Blend. To steam the pak choi, trim the base off the bulb and separate the leaves. 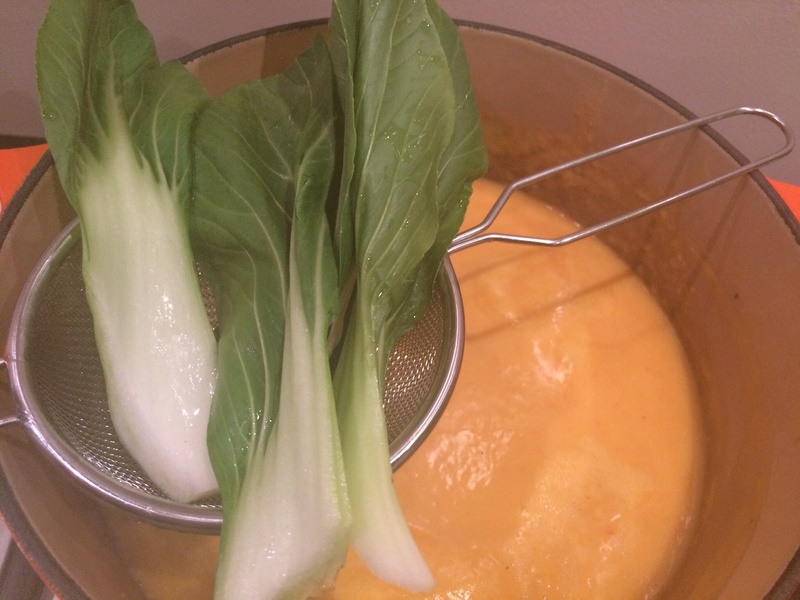 You can place the leaves in a colander and put this over the broth while it reheats. Place a lid over the pan and obviously make sure that the colander sits above the broth. It only takes a couple of minutes for the pak choi to cook. Chop the remaining garlic and the coriander leaves. 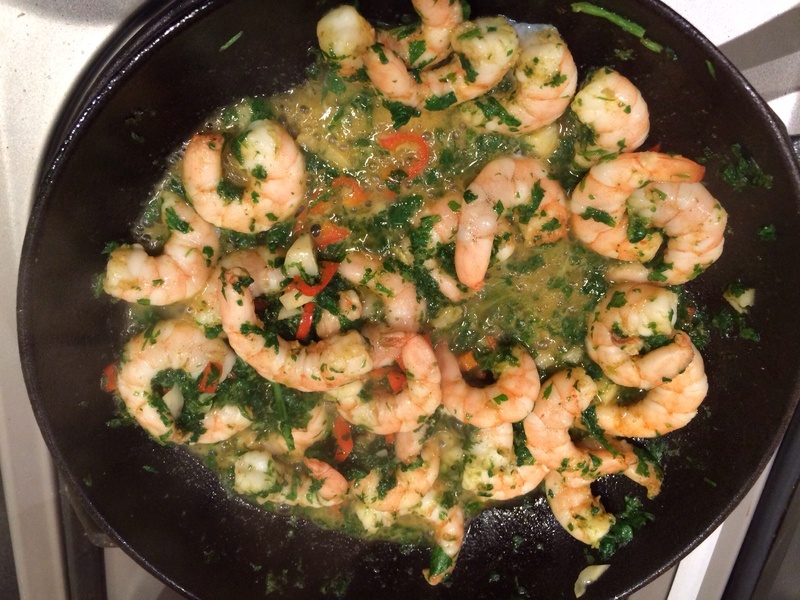 Melt the butter in a frying pan and add the prawns, paprika, garlic, remaining chilli and coriander. Cook until the prawns turn pink. 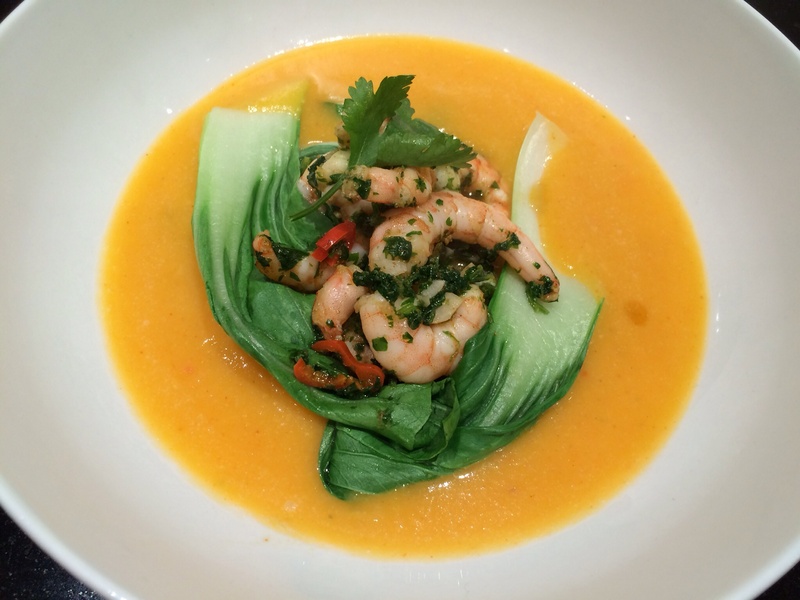 Place a couple of ladles of soup into each bowl, add half of the pak choi leaves and prawns to each bowl. Season with some black pepper. Delicious! If there is any broth left over you can make it into a lighter soup tomorrow by adding some vegetable stock. Any unused coconut milk can be frozen in a freezer bag and used later in another recipe.